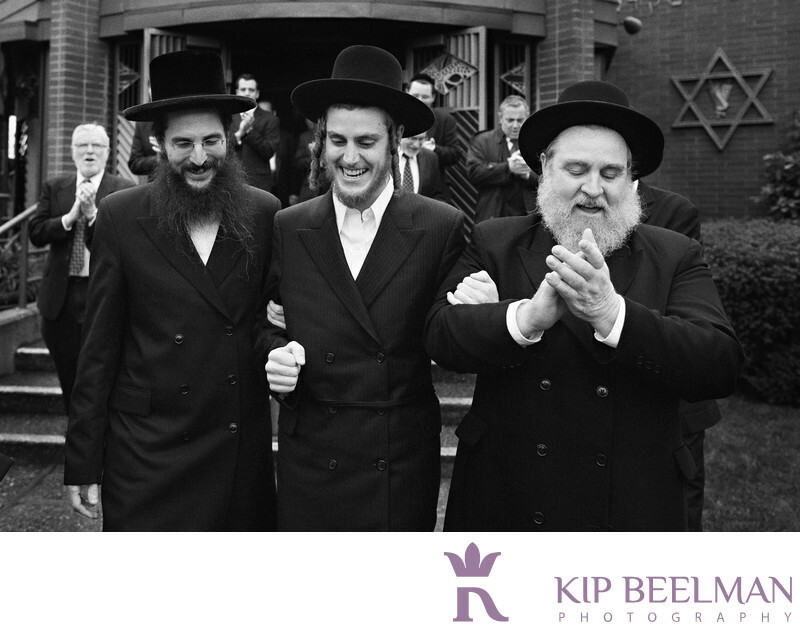 These Sephardic Bikur Holim wedding photos are near and dear as no great Jewish Orthodox wedding photos can be made without a great deal of physicality and determination. This image was taken with my 35mm lens as the bridegroom was just leaving his tisch en route to the unveiling of his bride. For those that have not had the opportunity to partake in or witness what is a truly great wedding ritual, in short, it’s almost like a rugby scrum during the bedeken where the island of men bridge the gap to encounter the island of women at the bride’s throne under fierce singing and celebration. This ceremony was held outdoors under the chuppah, a symbol of the home the new couple will build together, with the bride and both moms circling 7 times, followed by blessings, wine, exchanging of the rings, reading of the ketubah, 7 blessings and the breaking of the glass before they were escorted to their yichud. So lively, so fun. The dancing, oh the dancing. I always get a kick out watching the “Feats of Strength” portion of the reception where the men and boys perform all sorts of stunts in attempt to impress the bride and groom: Acrobatic juggling, juggling fire, etc. Photographing Jewish Orthodox weddings in an up close and personal style is going to result in some broken equipment and well-earned shots. I’d like to thank Eliza Truitt for inviting me to photograph the rituals and celebrations of the men while she was with the women. Location: 6500 52nd Ave S, Seattle, WA 98118. Keywords: Jewish Wedding (18), Seattle (111).